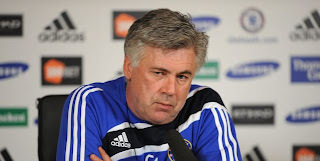 Deluded Ancelotti isn't watching the same performances I am obviously! Carlo Ancelotti has spoken after the Manchester City game, our second defeat in the Premier League in the last 3 games and I am not buying it at all. Thank god we can focus on the FA Cup at the weekend because at the moment we are awful in the League. But, once more it seems as though Ancelotti has this "shrug of the shoulder outlook" on our defeat and performance which is not what I personally want to see. Ancelotti says we have confidence in our play. Is he watching the same game I am?. Where is the confidence he is talking about. Looking at our last 14 League games dating back to 5th December when we lost at Eastlands we have only won 7 of them. Does that show confidence in our play to you?. Granted we have only lost 2 games out of 14 BUT that also includes 4 draws against sides we should be beating with the players and squad we have. Since that defeat we have lost against Everton away along with the defeat against City at the weekend. Its the draws we have suffered against Everton at home (where we have only ourselves to blame), West Ham away (where stupid mistakes cost us again), Birmingham away (we run out of ideas in the final third) and Hull away (we get found out defending a set play once more) that has cost us this season. So to me that isn't a confidence through the team. That shows that we are making stupid mistakes in games we should take the three points in. Shows that we are lacking in ideas when it comes to the final third and I believe thats down to his team selection and tactics/formation. He got found out against Inter Milan last week and once more on Saturday in two high profile games. I hate to say it but way back in the Summer I posted on here that the "Jury is out" as far as Ancelotti is concerned and granted I maybe going over the top at the moment about Carlo, but think about it. Am I really blowing things out of proportion?. I sincerley hope like the rest of you that the side can pull it together and replicate our fantastic start to the season. This game at Arsenal away was the last game we played of our great start and we have been in a slow decline ever since. Our decline in form coincides with the fact that we miss Essien without question, but still we should of not dropped points in 3 of those 4 games. Of course all the goings on surrounding certain players off the field has not helped the club in any way at all and no matter what front they are showing in Press Conferences etc, it is affecting them and our performances in the last three weeks. I really really hope I am wrong for the remainder of the season. The evidence is there to see. We are not playing with confidence at all. We are at times struggling through games and dropping important points where we shouldn't be. The only solice we have at the moment is the fact that we are still (believe it or not!) a point clear of United in the Premier League and three points clear of the side to look out for in my opinion Arsenal. But, our run in till the end of the season is the most difficult out of the three sides. We are faced with games at the Bridge against: West Ham, Villa, Bolton, Stoke and Wigan. Away games at Blackburn, Portsmouth, Man Utd, Tottenham and Liverpool. We need to regroup ahead of the Stoke game this weekend. Then after that game we have a clear week to prepare and get things right for the next two games that are now massive. West Ham at home (which you would never think of a massive game for us) and Inter Milan after. This is a difficult time for Chelsea fans at the moment. We all know we aren't playing well and we know its because of the formation and substitutions that he makes to change a game that no one can understand. Let's hope someone speaks up, makes him see where the problem lies and we get back on track because if this continues I can see us finishing third this season and we all know THAT AIN'T GOOD ENOUGH!